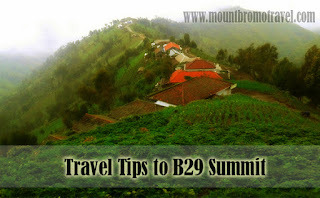 Get the best Travel tips to B29 Summit when you want to visit there. Everyone that want to go to the B29 peak must know the safest experience when they got to the destination and ensure the best visit and convenient method to enjoy. From the transportation, food and drinks during the travel, and many more. Thanks to the popularity because it makes B29 get easier access since this become the most destination object to view Mount Bromo panoramic. The rural route is available in good condition and it has easy hiking trek that easy to follow. It is best for you to choose your starting point to get best Travel tips to B29 Summit because there are several routes that available to reach the summit. Here the two most common routes that popular. If you start your walk from Bromo, you are available to use jeep or hire trail bike to reach the B29 summit. From the starting point, you are able to visit other interesting spot such as Savanna field, Whispering sands, and Teletubbies Hill. When you arrive from big towns such as Malang or Surabaya, you can go to Senduro village and next to Argosari village. With this point, you are able to go with foot, use car or motorbike to reach the summit passing the rural route. Here the tips for you when you take the point. Ensure that you go to the summit with right vehicles because there are no public transportation except the taxi motor in this area. Hire a car or jeep is the best, but if you are limited in budget, use motorbike. It is recommended to no rent automatic motor bike because it unavailable to tackle the rough route. Just use motorbike taxi or pay bigger CC if you available. For the adventure route and people that have good stamina, take travel to B29 summit by walking from Argosari Village. It takes about 3-4 hours to reach. Make sure that you carry right object for your safety. Bring warm clothes and jacket because it has chilly temperature especially in afternoon. The road will be slippery when rain falls. It is not recommended to walk after rain. Make sure you read the local weather signs and guide when you take walk to summit. There is also many local food stalls and selling snack and water in along the route, so you not need to carry much water containers. This Travel tips to B29 Summit will make you able to enjoy your travel in comfort and safe.